If you really want to master all the guns RDR2 has to offer then our Red Dead Redemption 2 Weapons Expert Challenges are something you should really think about ticking off. There are 10 in total, covering everything from guns to bows, throwable stuff and more that will improves your killin' skills in no time. 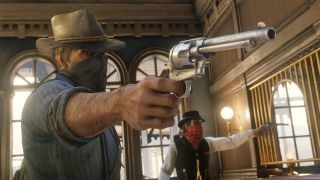 You'll need to tackle these Red Dead Redemption 2 challenges one at a time and using our Red Dead Redemption 2 Weapons Expert Challenges guide will help you hit the specific requirements needed and complete each one in no time. You will automatically complete this task during the story mission called Paying a Social Call, which has you stealth killing a bunch of bandits, but otherwise we recommend using Arthur’s knife as a covert weapon to get these kills, as it quickly uses its viability when enemies start whipping out their firearms. During the same story mission, Paying a Social Call, you’ll receive a set of throwing knives. Equip them, and use the deadeye to chuck several at various enemies in succession, aiming for the head to ensure a kill, and this challenge will be completed. This one’s tricky. You can buy tomahawks from the Fence at Emerald Station, but it’s not exactly a cakewalk to hit falcons and owls out of the sky with the projectile, even when using deadeye. The best trick I’ve found is kill an animal or bandit before leaving their body to rot for a while, in the hopes of attracting any nearby birds of prey to descend upon the free meal. Otherwise, some birds can be found perched stationary on rocks near rivers, and Fences at farms, but it may take you a while to get all three. You can craft shotgun ammo from the crafting menu at a campfire, and the easiest option is to create Split Point bullets using your knife, as this doesn't require any other ingredients or recipes for you discover as a prerequisite. Following that, equip the right bullets using the weapon wheel, before offloading them into any nearby humans. Throwing knives aren't exactly the most dangerous tools in Arthur's arsenal, so you'll need to score headshots to ensure you get the kill with a single hit per knife. For finding enough horseback enemies, rack up a bounty of over $200 in one state, and a bunch of them will hunt you down in no time. Dynamite can be bought from gunsmiths or crafted at camp fires, and you'll need to light and throw one into a crowd of conglomerated enemies for a chance of killing 4 with one stick. Their radius isn't as large as you might expect, so use Dead Eye if you need your throw to be as precise as possible. Tomahawks can be retrieved once thrown simply by running over to the spot where they landed, and Arthur will automatically pick it up. Like the throwing knives, you'll need to aim for the head to secure the kill on an enemy; rinse and repeat this process three more times in succession, and the challenge will complete. Long barrelled shotguns can be bought and customised from gunsmiths in towns around Red Dead Redemption 2, so purchase one, take it out to a nearby bandit camp, and fire away to easily finish up this straightforward challenge. Bows are great for stealth kills as long as you guarentee one hit kills with headshots, so aim for enemies' noggins from behind for this challenge. Stay crouched and slow to avoid being spotted, and make sure you pick your arrows back up from their corpses to save on having to buy any more. Grizzly bears can be found in the more mountanous regions of Red Dead Redemption 2's open world, but killing one in this way is very, very hard. Make sure you have plenty of throwing knives (like, at least two dozen), and to avoid taking damage you'll need to have a strong degree of stamina to outrun the animal whenever he comes in for an attack. It'll be a slow, arduous fight, but worth it for finishing the entire Master Hunter Challenge set by the end.